Proserpina-Tergestea convoy passed Derna at 0430 26th. I … approached … at a 45º angle from abeam and, at 700 yards' [640 m] range, I pressed the release button and saw the torpedo streak toward the target. At that moment, one of the Bisleys dropped a delayed-action bomb on the ship, then pulled up sharply, a second too late. Its port wing struck the vessel's foremast, which sheared the wing off just as the second Bisley came in to attack. Up in the nose of our aircraft my navigator, Norm Spark, captured the moment on his camera for posterity but it looked like our attack had been a dud—the torpedo had failed to explode. … led a formation of aircraft detailed to make a low level attack on an enemy supply convoy off Tobruk. In the face of intense anti-aircraft fire Major Pidsley gallantly pressed home that attack at mast height. He secured a direct hit on the stern of a tanker causing a fire which destroyed the ship. Although his aircraft received severe damage [he] flew it to base safely. By 1700 GMT the Luftwaffe had reported that Proserpina was on fire from stem to stern and that a fire float was on its way; efforts would be made to tow the tanker in but she was likely to be total loss. Lieutenant Edward Dustow’s Bisley of No. 15 Sqn. SAAF struck a mast during its bomb run and crashed into the sea with the deaths of its crew. The intense heat coming off Prosperpina prevented an RAF night attack but she finally sank at 0445 hours on 27 October. Remarkably, the Axis reported that the crew of one British aircraft “crashing on deck” deck had been saved. This appears to refer to a Bisley which hit the mast of the Dora in the main body of the convoy, Lt. Groch (pilot) and Sgt. Twigg (gunner) surviving the impact. NOTES: Two Ju 88 of I./LG 1, one of them flown by Ltn. Benno Farkac, were among the assigned escorts that day, their initial experiences mirroring those of the RAF strike force: no ships in the briefed position, only a group of coastal lighters encountered soon after. Following a formation of British bombers westward however, they saw the convoy off Tobruk, witnessing the attack which set the tanker ablaze. A month later German audiences were able to see vivid film of the attack on the main convoy, as part of the Deutsche Wochenschau newsreel. A North African ground station was to jam British radars on the night of the 26/27th to cover a convoy and RCM aircraft (number unknown) were also due to operate; the next night, a single Heinkel jammer operated. Another tanker, Luisiano, was underway to Africa on the 26th, flying a barrage balloon for defence; Fliegerkorps II was to have one bomber continuously over the convoy in addition to a “jamming operation” (whether air-, sea- or ground-based was not stated). On the night of 28 October, Luisiano was to be protected by two of Kdo. Koch’s Heinkels and similar cover was assigned to the auxiliary cruiser Barletta the following night, along with a Ju 88 from LG 1. The struggle for supremacy in the Mediterranean has reached its height. The Luftwaffe is playing a decisive part in this struggle. The aim of supplying the Panzer Army and the Luftwaffe in Africa must be achieved. It is a matter of honour for each man of my Luftflotte … I expect that each will do his duty to the limit. The position had become so serious that Field Marshal Kesselring cancelled all Luftwaffe leave in his sphere of command as of the 29th and ordered that personnel currently on leave be recalled. Two aircraft were again operating on the night of the 29/30th, in support of Barletta and tanker Potofino; one of these Heinkels was GJ+JH. 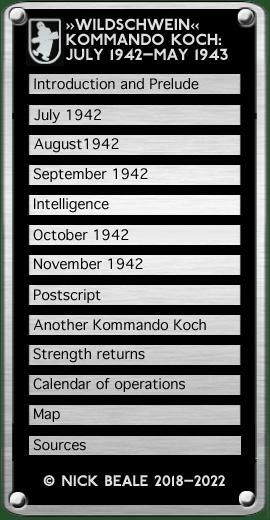 The Kommando reported a strength of 7 (3) aircraft on 30 October and was due to operate three Heinkels from 1740–0500 that night, covering the auxiliary cruiser Zara. Two Heinkel jammers flew on the 31st, to protect Barletta and Alfredo convoys, the former machine assigned taking off at 1603 hours. A fourth He 111 was on anti-submarine patrol over the Aegean and the Antikythera Channel. NOTE: MV Barletta would survive the RAF's efforts, only to be sunk in the Luftwaffe attack on Bari on 2 December 1942.